Note: Our virtual reality for business feature has been fully updated. This article was first published in November 2014. Outside of the gaming sector where VR will show what it is capable of to a waiting public, VR as a business tool has also been rapidly developing. 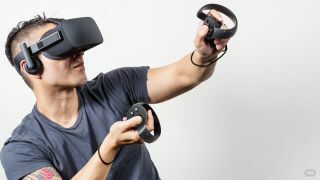 Since the early developer units were available from Oculus, many enterprises have been experimenting with these new virtual spaces. Jaguar created what it called its 'Actual Reality' VR experience with a custom headset and a hydraulic platform with six-degrees of movement to create a fully immersive experience for its new F-Type car. Shopping has also experimented with virtual stores that you can move through albeit on a two-dimensional screen. Cheap access to a VR-like environment thanks to Google Cardboard makes for the perfect platform to offer a more interactive and tactile virtual shopping experience, as Trillenium is developing right now. We could all be experiencing what has been dubbed 'V-commerce' pretty soon. The experience of 30 years in the design, tech and publishing industries has resulted in Dean's broad skill-base, all brought into play at Brandwidth, with brand creation, development and application at the heart, working across digital storytelling, narrative and audience engagement. Mark's first company was Curtis Hoy, which pioneered radio sales promotion from 1989. Highlights included introducing fixed frequency low-cost radios as a sampling driver for the Pepsi taste test, bringing drive-in movies to the UK for the first time ever (Diet Pepsi) and designing the first marketing use of virtual reality in 1993 (for a Unilever brand). Bertie manages the world's first marketing agency specifically aimed at helping virtual reality companies develop and grow their businesses. The firm works with developers and production studios, helping to promote their services to the general public and large brands seeking to create experiences using virtual reality. Chris Savage is the chief executive and co-founder of Wistia, a video marketing and analytics platform that helps businesses host, customise, and measure video content. Engage Works is behind the Flux LDN Innovation Lounge (one of the TimeOut blog's five hot venues to check out). It's a global business that has just expanded to Dubai. VR is a key part of Engage's offering and the company hosts headsets in its Innovation Lounge. Over the last few years, Alasdair has led FITCH EMEA to win awards at Cannes Lions, LIAs, Eurobest, World Retail Awards Store Design of the Year and Retail Week Interior Awards: Design Team of the Year. He has judged at Cannes Lions, the Brandrepublic Digital Awards and D&AD New Blood. Luke oversees the management, strategy and day-to-day running of Interactive Arts in London. In 2016 he guides the company's involvement in Google's Made w/Code initiative which has seen the development of many interactive web projects and the fantastic real-time installation, Holiday Trees, in front of the White House. With nearly 30 years of marketing experience on both the agency and client side, Joss believes that you have to be challenging creatively to grow business sales. He says that technology is reshaping our world, and only those businesses that can leverage these changes will be successful. Next Page Which VR platform?